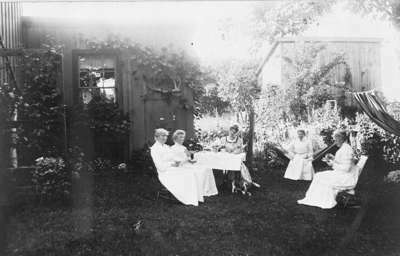 Black and white negative of a photograph showing a neighbourhood tea party at the Borrowman residence which was located at 214 Trent Street West on the north side between Byron and Centre Streets. The women are seated on chairs holding teacups. James Borrowman (1800-1876) and Margaret Murray (1809-1854) were married Ayrshire, Scotland in 1839. They had seven children in there and came to Canada, settling at Port Whitby in 1854. Their seven children were: Margaret (1840-1927), Adam (1842-1912), Elizabeth (1843-1905), James (1845- ), Charles Owen (1847-1915), John (1848- ), Louisa (1851-1914).